Picture 2 middle aged women (60 is still middle aged, right? ), ruddy cheeked, faces tucked into their coats, happily clambering about, cameras in hand. 'Cause there's snow on the beach. Not much, grant you, but snow, there is! I love this shot; the snow added such neat sparkle and texture to the beach grass - just gorgeous! Now, go see all the pretties! 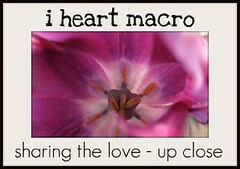 Linking up with "I Heart Macro" and "Macro Monday." The glorious reds, yellows, and oranges are gone. There's a softer beauty now, found in the curves and lines. The empty negative spaces create their own designs. Beauty literally underfoot; we just have to notice. I'm sipping my coffee, meandering through blogs, enjoying the gift of time. Sandy's here, not yet in "her full glory," but enough to make her presence known. One very wet Australian shepherd sleeps in the "drying room," hoping not to forever resemble a sopping canine sponge. I'm beginning to process my style - clean graphic shapes, repetition, circles. Rust appeals, as does things that carry a history. Not so much vintage; you know the type...pointy hats, soft dreamy images, and the like. Not that there's anything wrong with any of that; it just doesn't grab me. Not enough texture? Not sure, as this is all just beginning to gel in my mind. I'll be working more on this today; it's something I can do whether the power remains on or not. Well, as long as it's daylight, at any rate! It's rather ironic that I chose this image, of a wheel and gears that no longer turn, when the ones in my mind seem to be going full blast. I do think that the universe enjoys a good joke now and then. I'm planning on meandering through most of my day, working on assignments for Lesley Riley's "Compose Yourself" class, editing some photos, and reading. So many cars outside, making me grateful that I don't need to be out and about in this mess. So, Sandy, here's what I want to say: I know you're going to create an unfathomable mess. I know you're going to flood the East Coast and do incrediable damage. I know all this, but right now, you've given me the gift of some time, and for this gift, thank you. Linking up with Macro Monday and I Heart Macro. I love dandelions - always have, always will! Yup, they're weeds; I know that. But...that yellow! And, that will and determination to survive..well, they're winners in my book. So, as I sat in Ny, while my sister fiddled with some settings and a new macro lens, I decided to photograph a few of these lovelies. And, then back home, I began to play in photoshop elements. Just loving the color in this one! So very bright and happy, and it makes me grin. I will probably add a quote at some point, but for now, it's "done." The very same dandelion...the very same shot, but so much more soft and dreamy, courtesy of a few technques, learned from Kim Klassen's Beyond Layers II course. This one brings me peace; it soothes. I'm loving each version, but for different reasons. Dandelions symbolize happiness, wishes coming true, along with summer and childhood. Our early settlers deliberately transplanted dandelions to their new homes. It's believed that you can send a message to someone by visualizing your message on the snowy white seed head before you blow on it. Tradition held that the tallest dandelion stalk a child would find in early spring would show how much taller they'd grow in the coming year. Long ago brides wove dandelions into their bouquets for a long, happy union. Linking up with Macro Monday here, along with I Heart Macro. And, of course, the August Break, 2012: Day 13! Kenilworth Gardens a week ago...such magic. Linking here for Macro Monday, along with I Heart Macro....see button below!